Raaga.com: Untold story of Rajesh Khanna's bungalow that will soon become history! 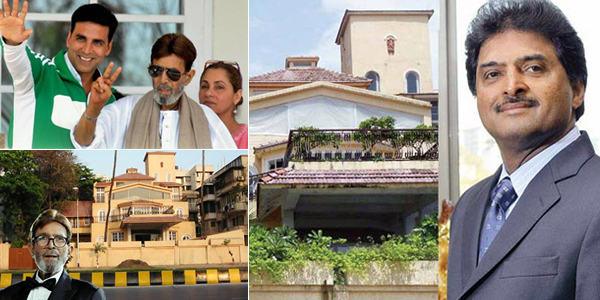 Untold story of Rajesh Khanna's bungalow that will soon become history! India’s first superstar Rajesh Khanna’s renowned bungalow Ashirwad will soon become part of history as the new owner Shashi Kiran Shetty, Executive Chairperson of Allcargo Logistics, part of Avvashya Group, has decided to demolish the 6,500-square-foot property into a multi-storey building. It may be noted Shetty had bought the property at a whopping price of Rs 90 Crore! As the bungalow will soon go into dust and in its place a new multi-storey building will come up, let me enlighten the readers about the strange story of the bungalow. Few are aware that in the early 60’s when Bandra’s Carter road area facing the bewitching Arabian Sea was developing, music maestro Naushad had build his bungalow Aashiyana and at a stone’s throw there stood another bungalow which was empty. Nobody dared to purchase it due to superstitious tales of the bungalow being hunted. However upcoming actor Rajendra Kumar, who was an acumen businessman rubbished all the tales and bought the bungalow at a cheap rate of mere Rs 60,000/-. He named the bungalow ‘Dimple’ on his daughter’s name. Surprisingly what was regarded as hunted bungalow turned a gold mine for Rajendra Kumar and his luck skyrocketed and he became a superstar and won the title of Jubilee Kumar (as all his films created jubilee at box office). Meanwhile he even purchased a bungalow at Pali Hill in Bandra and shifted into it. When Rajesh Khanna, another struggling actor came to know that Rajendra Kumar had shifted into his Pali Hill bungalow he contacted him and urged to sell his carter road bungalow to him. In fact Khanna hoped the ‘Lucky’ bungalow may prove a blessing for him too. After lot of pondering Rajendra Kumar gave in. Rajesh Khanna renamed the bungalow as Ashirwad and as expected the bungalow brought bagful of smile for Khanna and in a single year he delivered 15 hits and won the elusive title of India’s First Original Superstar! It was at this bungalow Rajesh Khanna later saw his downfall too and breathe his last. Now the bungalow is being demolished…one wonders will it bring luck to the new owner Shashi Kiran Shetty as it did for Rajendra Kumar and Rajesh Khanna or will it bring his dome only future will tell!